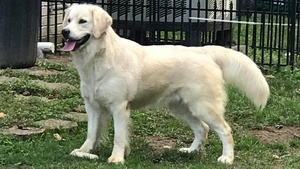 Carolina Goldens’ Alaska is an English Cream Retriever registered by the AKC (American Kennel Club) and the CKC (Continental Kennel Club). She weighs approximately 80 lbs. She takes care of our other dogs and is very intelligent. She was purchased from Carolina Goldens in Rutherfordton, North Carolina and was raised in our home from a puppy. Alaska comes from excellent lineage including several service dogs who serve special needs children and military veterans.